Remember that test knit I finished way back in May but couldn’t post about? 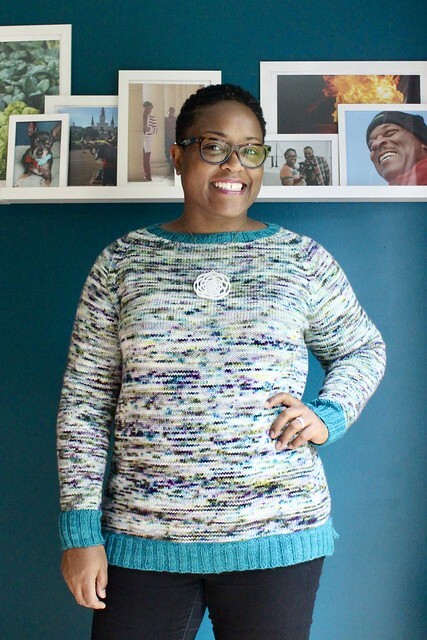 Well, the pattern has been released and I can finally share the Boardwalk sweater with you. I know at first you’re thinking, okay it’s a nice sweater but what’s special about it? 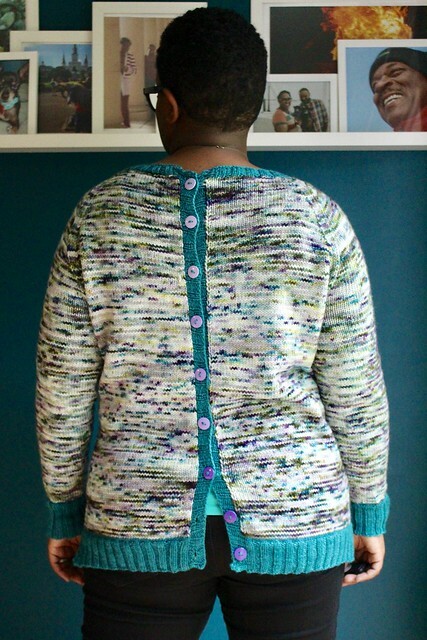 Well…I’ve been wanting to knit a sweater with buttons down the back and this pattern is for a cardigan you can choose to knit to wear the buttons in the front or in the back. They just alter the shaping a bit depending on how you wan to wear it. And honestly, you could wear it both ways in my opinion regardless of how you knit it. I knit this entirely with Miss Babs Yowza (it really is a favorite yarn of mine for it’s durability, softness, the colors AND it has 560 yards per skein). The body is knit with the colorway Spread Your Wings that I bought at the 2017 Maryland Sheep and Wool Festival and had been holding on to for something special and the ribbing was all done in the colorway Rainforest. It’s really pretty teal blue that I originally used in my Technicolor Dream Coat. I love when I can finally use a yarn I’ve been holding on to and the color and the pattern turn out beautifully. 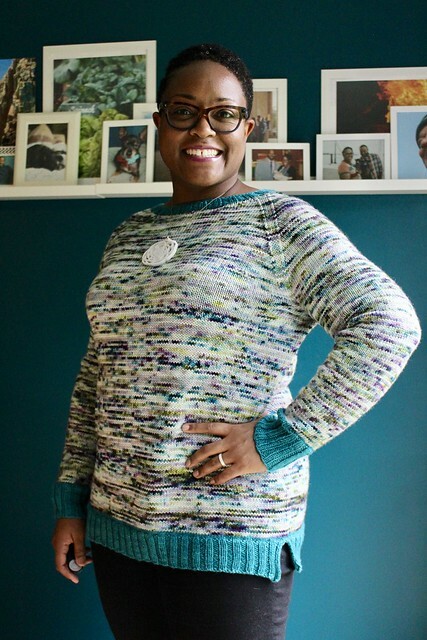 I was sad that I was knitting this sweater and wouldn’t be able to wear it until the fall because I love the fit and style. It has a split hem, it has a bit of ease built into it and I just love the buttons down the back. I decided to pick up the flecks of purple in the Spread Your Wings colorway and do varying shades of purple going from light to dark down the back. I enjoying doing a few test knits a year. It’s fun to see the process for designers and I always enjoy helping making a pattern clearer. Plus I get a sneak peek at what’s coming down the pipeline! I’m actually working on another test knit right now for a different designer that will be released in August so you’ll see more secret projects soon! Does anyone else enjoy test knitting? I think we’re on the same wavelength because I have been wondering ever since I saw the pattern if you could wear Carbeth cardigan backwards?! You are the perfect person to ask since you have made it (and more than once!) Also I got some Intent at your suggestion to make one! I’ve made the pullover but prefer the flexibility of a cardigan. Welcome home-I know the girls were thrilled to see you and vice versa! 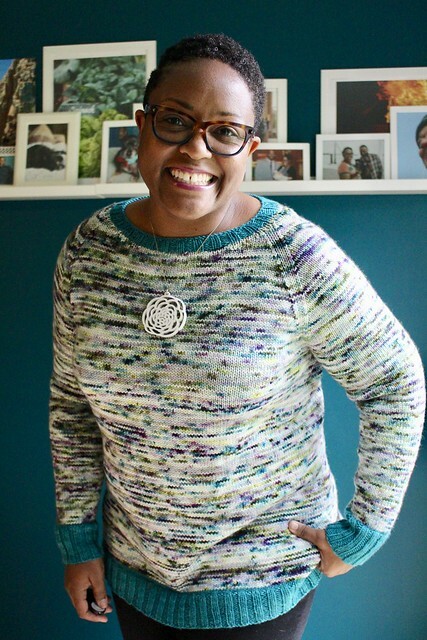 So I didn’t knit my Carbeth neckline as high (I don’t have a lot of neck), so I’d say if you knit it lower you probably could wear it backwards…I might need to pull mine out of my storage bin and check. Oh and the girls were delighted to see me. Jellybean gave me hell all day, followed me around and or made me carry her until about 7pm. LOL I was clearly missed. Looks very nice – it’s a classic style that’s not boring. The speckles look great. I love the choice of purple buttons against the teal blue! Beautiful job. Enjoy! Adorable. I love everything you knit! AWESOME!!! Love the colorway! And the button color changes are such a subtle, but great accessory to a wonderfully made FO! Way to go DWJ! You’ve done it again. Gorgeous sweater! I love your added touch of varying shades of purple buttons. I’ve done a couple of test knits and I enjoyed it. But right now, I have too many plans of my own to take on another project. It’s beautiful. I love your color choices and especially your idea about the purple buttons. Good job. I loved this pattern when it came out last week, and especially love your version!! I adore the colors you used. As soon as I saw it released, I put it on my Wish List…for those patterns that I desperately want to get to one day. I used to test knit and crochet; however I found that life got in the way and it was too stressful. I have limited crafting time right now and I wouldn’t want to not meet a deadline.